Do Indian batsmen slow down in the 90s? To cut to the chase, the answer is yes. 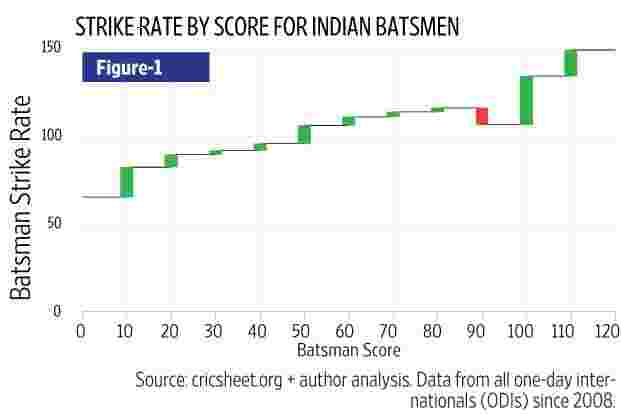 As figure 1 shows, strike rate (runs scored per 100 balls) for Indian batsmen batting in the 90s is a full 10 points lower than it is when they are in their 80s. 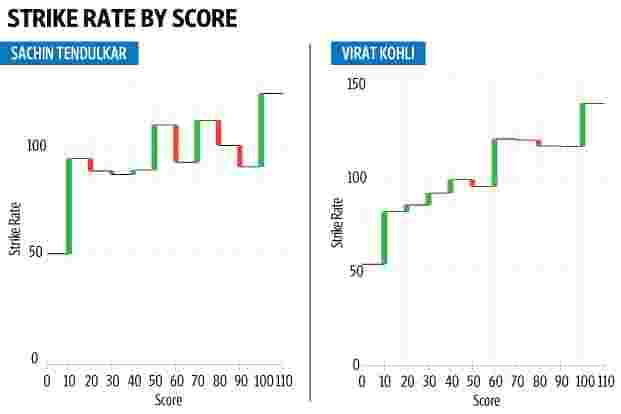 The figure also shows that Indian batsmen accelerate after reaching their centuries; their strike rate jumps by close to 30 points after the landmark is reached. (Source: cricsheet.org + author analysis. Data from all one-day internationals 2008). This statistic is pertinent in the context of the comment made by Australian all-rounder Glenn Maxwell (following Australia taking an unassailable 3-0 lead in their ongoing ODI series against India. Maxwell claimed that India had lost because their batsmen would slow down in pursuit of personal landmarks (such as a century), putting their personal interest ahead of their team’s. This is not the first time Indian batsmen have been accused of playing for personal glory. Another Australian cricketer, Matthew Hayden, levelled similar charges in 2004. The problem with such observations is that they might be biased by recent events (that Rohit Sharma scored centuries in the first two ODIs, both of which India lost, mattered here, for example), and based on a limited number of observations. Hence, it is important to look at a fuller dataset to understand whether this allegation is correct. Conventional wisdom tells us that a batsman starts off slowly as he seeks to settle down, get a feel of the wicket and gauge the bowlers. As the batsman bats longer, the scoring rate is expected to increase monotonically. Consequently, we would expect a batsman to score faster in his 90s than in his 80s. If a batsman slows down in his 90s, however, it can be hypothesised that it is due to his pursuit of a personal landmark in the so-called “nervous nineties". Statistics such as strike rate by score (or balls played) are not easily available, so they had to be constructed based on ball-by-ball data put out by cricsheet.org, an online provider of cricket data. The data takes into account all ODIs from May 2016 to the third ODI between India and Australia on Wednesday (after which Maxwell made his remarks). In order to eliminate noise, scores have been put in buckets of 10. 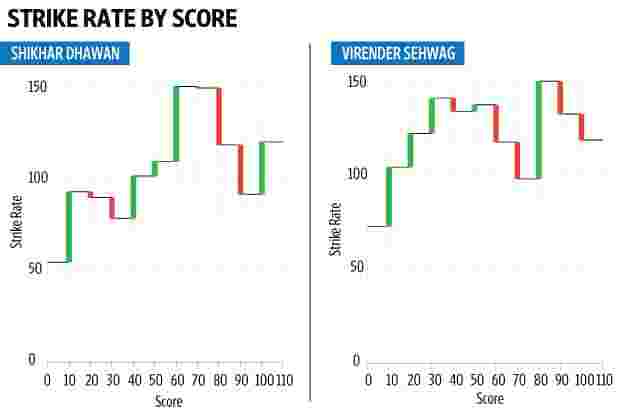 While Figure 1 makes it clear that Indian batsmen slow down in their 90s, they are by no means the worst offenders. 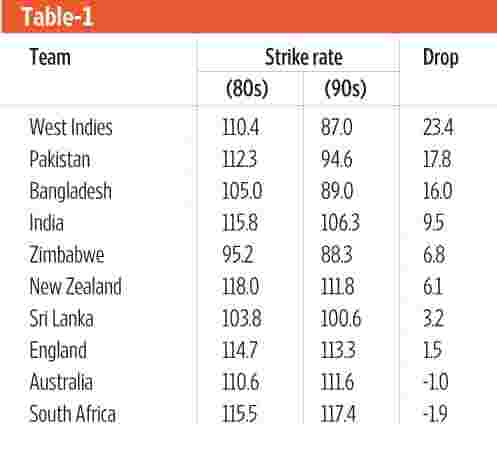 Table 1 shows the average strike rates in 80s and 90s by country, and we can see that batsmen from the West Indies, Pakistan and Bangladesh are much worse when it comes to slowing down in their 90s. To Maxwell and Hayden’s credit, Australia’s batsmen (on an average) actually speed up marginally when they hit the 90s. It might be tempting to stick to country-level averages and possibly build a cultural narrative, but that might obscure the fact that different batsmen from the same country might behave differently as they reach the 90s. Hence, it is important to look at the data at the individual batsman level, comparing strike rates between the 80s and 90s. Table 2 compares different Indian batsmen on their scoring behaviour (in order to eliminate noisy data, we have only considered batsmen who have played at least 30 balls in their 90s). 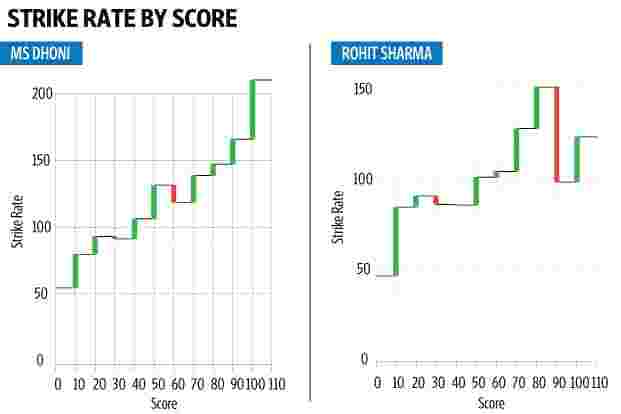 It is pertinent to note that the worst offender (batsman whose strike rate drops the most on entering the 90s) is Rohit Sharma, who scored centuries in the first two games of the ongoing series against Australia. He is followed by his current opening partner Shikhar Dhawan. This data also confirms the ubiquitous hypothesis from the 1990s that Sachin Tendulkar slowed down when he reached his 90s (though his drop is much less than that of someone like Sharma). 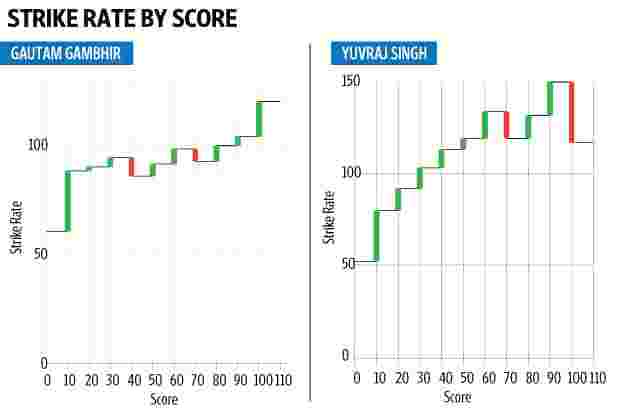 Mahendra Singh Dhoni and Yuvraj Singh, on the other hand, speed up their scoring significantly when they hit their 90s. The difference between the scoring rate in the 80s and 90s is a good indicator of slowing down in sight of a century, but doesn’t necessarily tell the full story. Some batsmen, for example, might slow down earlier. For this reason, we need to look at their full scoring pattern (strike rate as a function of batting score). Looking at the charts for Indian batsmen below, we can see that each has his own quirk. Sharma slows down drastically in his 90s, for example, while Dhawan and Tendulkar start slowing down at 80. Virender Sehwag’s chart shows no particular pattern (notice the jump in the 80s) while Yuvraj Singh slows down after his century is reached. Finally, how bad is Rohit Sharma compared to batsmen from other countries? 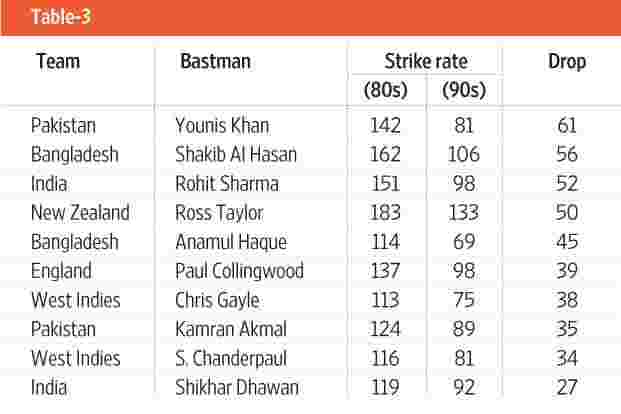 Table 3 shows the top 10 global “worst offenders" (batsmen whose strike rates fall the most between 80s and 90s). India has two entries in this list—Rohit Sharma in third place and Shikhar Dhawan in 10th. They are also our current opening combination in ODIs.